Khenpo Jikme Phuntsok Jungné (Tib. འཇིགས་མེད་ཕུན་ཚོགས་འབྱུང་གནས་, Wyl. 'jigs med phun tshogs 'byung gnas) (1933-2004) was an incarnation of Tertön Sogyal Lerab Lingpa and an emanation of Mipham Rinpoche. He revealed a number of termas in Tibet, Bhutan, China, Nepal and India. He played an extremely important role in the revival of Buddhism in Tibet after the Cultural Revolution. In the later part of his life more than 10,000 students gathered around him at Larung Gar in Sertar in Eastern Tibet. At the age of five, Khenpo was recognized as the reincarnation of Tertön Sogyal, and became a monk at Nubzur Gonpa, a branch of Palyul monastery in Sertar. At nine he took ordination from Khenpo Sonam Rinchen of Drakdzong and received the name Thupten Lekshé Zangpo. Once, when he was fifteen, he was overcome by intense devotion for the Dzogchen teachings and especially for Jamgön Mipham Rinpoche, who appeared to him in a vision, and granted his blessings so that Khen Rinpoche experienced the nature of mind. From the age of eighteen, he studied with the great Khenpo Thubga Rinpoche at Changma Hermitage in Dzachukha, receiving teachings on Mahayoga, Anuyoga and Atiyoga. At twenty-two he received full monastic ordination and at twenty-four he was enthroned as the abbot of Nubzur Monastery, which is a branch of Palyul Monastery. During the time of the Chinese invasion and occupation of Tibet, starting in 1950, Khenpo withdrew increasingly from normal monastic life until in 1959 he took to the remote mountains, herding a small flock of goats and sheep. There, for the next twenty years, he secretly engaged in meditation and occasionally taught small numbers of disciples, often basing his instructions on the Seven Treasures of Longchenpa. Throughout this time, he was able, through legendary exploits and means, to elude the Chinese authorities. Then, in 1980, he founded Larung Gar in accordance with the prophecy of the First Dodrupchen Rinpoche. It went on to become the largest Buddhist teaching centre in the world. In 1987, Khenpo led hundreds of his disciples from the Institute on a pilgrimage to the sacred mountains of Wu Tai Shan in China's Shaanxi Province. En route in Beijing, he met the Tenth Panchen Lama, Chökyi Gyaltsen, and gave teachings on the Thirty-Seven Practices of the Bodhisattvas to a crowd of over 5,000 people, including Tibetans, Chinese, Mongolians, and other Buddhist practitioners. At Wu Tai Shan, the audience for his teachings swelled to 10,000 on occasions. He also undertook retreats at sacred locations and caves. There are accounts of many extraordinary occurrences during this pilgrimage. Khenpo made extensive travels across Tibet and China, teaching and revealing terma. 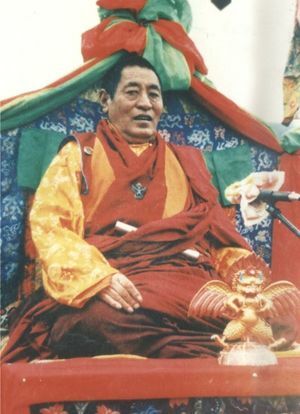 In 1990, at the invitation of Kyabjé Penor Rinpoche, he visited India, where he taught at various monasteries, including the Nyingma Institute in Mysore. At Dharamsala, the Dalai Lama resumed the connections he and Khenpo had in their previous lives by receiving teachings from Khenpo for two weeks. In the summer of 1993, he visited various Dharma centres in Inida, Bhutan, Hong Kong, Singapore, Malaysia, Taiwan, USA, Canada, and France, including Lerab Ling, where he gave empowerments and teachings including the empowerments of Tertön Sogyal’s termas, Tendrel Nyesel and Vajrakilaya, as well as his own terma treasures of Manjushri and Vajrakilaya, and Dzogchen teachings. Finally, at the age of 71, on the fifteenth day of the eleventh Tibetan month, of the Water Sheep year (7th January 2004), he passed into parinirvana while seated in the posture of meditation. Among the students who maintain [the] lineage [of Khenpo Jikme Phuntsok] are Tulku Lungtok of Shukchung, Tulku Chökyi Nyima of Wané, Khenchen Namdrol Rinpoche, Tulku Tendzin Gyatso, Tulku Rigpai Dorjé of Wané, Khenpo Tsultrim Lodrö, Khenpo Guru of Minyak, Khenpo Kunzang of Golok, Khenpo Chime Rigdzin of Mewa, and Khenpo Sherab Zangpo of Dergé. These and other living masters are still serving the teachings of the Victorious One. Khenpo Sodargye was also placed in charge of the Larung Gar Serthar Buddhist Institute by Khenchen Jigme Phuntsok and became his chief translator for Chinese disciples. In 1987 Khenpo Sodargye accompanied Khenpo Jigme Phuntsok during his pilgrimage to Wutai Shan and began to connect with Chinese disciples. From 1990 to 1999, he accompanied Khenchen Jigme Phuntsok during his teachings in many countries worldwide. Khenpo Sodargye now teaches widely in China and the West. This page was last edited on 5 June 2017, at 16:05.